Tashi Chöling provides a place of spiritual refuge and an established program of study and practice in order to preserve the authentic living tradition of Tibetan Buddhism for the benefit of all beings. 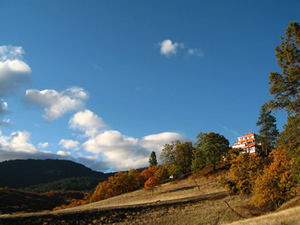 Tashi Chöling was founded in 1980 by the Buddhist master Venerable Gyatrul Rinpoche. For over 20 years, students have gathered here to study and practice the ancient spiritual tradition of Vajrayana Buddhism under the guidance of Gyatrul Rinpoche, a lama greatly loved for his wit, compassion, profound insight, and genuine humility. Over the course of the years, many other great living masters of Vajrayana Buddhism have visited and taught at Tashi Chöling, including H.H. Penor Rinpoche, Dodrup Chen Rinpoche, Yangthang Rinpoche, and Yeshe Dorje Rinpoche. All of the philosophic vehicles of Buddhism— the Hinayana path of personal salvation, the Mahayana path of those seeking liberation for all beings, and the esoteric Vajrayana teachings, often referred to as the "short path", arose from the life and teachings of Shakyamuni Buddha, born as Prince Siddhartha in northern India in the sixth century B.C. For many years, his father the king shielded Prince Siddhartha from the suffering of the world. When Siddhartha finally left the palace grounds, he was shocked to encounter the reality of old age, sickness and death. Disillusioned, Siddhartha renounced his life of luxury and determined to find spiritual truth. After six years of meditation, his practice brought him at last to deep spiritual realization and he became the Buddha, the Awakened One. Lord Buddha went on to teach for fifty years until he passed away at the age of eighty. Those fifty years of teachings can be divided into three periods. During the first period, Lord Buddha taught the Four Noble Truths: the truth of suffering, the cause of suffering, the cessation of suffering, and the way to end suffering by practicing the profound path of Dharma. The second time the Buddha taught, or turned the Dharma wheel, he discussed compassion and ‘emptiness,’ the ultimate nature of reality. The third turning of the Dharma wheel gave insight into Buddha Nature, the potential that all living beings have to become enlightened. Also taught then were the various esoteric methods of the Vajrayana, the Buddhist Tantric path. Buddhism was brought to Tibet from India by many great masters from the eighth to the twelfth centuries. First and foremost of these was Padmasambhava or Guru Rinpoche. His teachings are maintained to this very day in a tradition called the Nyingmapa, which is the tradition practiced at Tashi Choling. There are three other traditions or lineages and all consist of studying and practicing Lord Buddha’s teachings with special emphasis on the Vajrayana. Vajrayana, a vast system of profound philosophy and deep meditation, is considered the pinnacle of the Buddha’s teaching. It is a path that encompasses the three vehicles: Hinayana, Mahayana, and Vajrayana. Many Vajrayana practices engage all of our senses with mantras, chants, mandalas, visualizations, and ritual activity. Non-conceptual non-meditation practice provides the opportunity to rest in unfabricated, unconstructed mind. 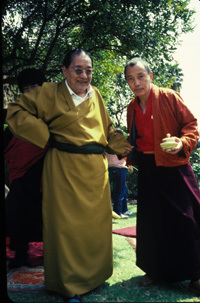 In Vajrayana, the teacher-disciple relationship is of great importance. Foundational or preliminary practices, called Ngondro, help practitioners to remove karmic hindrances and to increase spiritual merit and understanding. Group practices called either “Tsog” in Tibetan or “Puja” in Sanskrit are part of Vajrayana practice. Some are performed monthly and others are done in an annual retreat. More information on these practices at Tashi Choling is available in the Programs section of this site. Each puja focuses on a particular Buddhist deity. These deities are not gods, but symbolic manifestations of the various qualities of enlightenment. Some pujas require an empowerment from a lama and a few are not open to the public. All include an offering of food, so it is appropriate for a visitor to bring some. Pujas vary somewhat in structure but in general they begin with “Taking Refuge.” Taking Refuge is the student’s ongoing commitment to follow and practice the Buddhist path. Next is engendering Boddhicitta, the motivation to practice so that all sentient beings can be free of suffering and enter the state of enlightenment. We then visualize and invoke the deity and recite his or her mantra. Food is offered and partaken of. Finally, we imagine that everything dissolves into the state of emptiness. The merit from participating in the puja is then dedicated to all sentient beings. Tashi Choling provides a place where people can study and practice the vast array of Lord Buddha’s teachings as preserved within the Tibetan tradition. All are welcome to participate, learn, and contribute in whatever way their aspirations draw them.